It's not often (if ever) that you see theme park employees in Orlando wearing down parkas, especially in the middle of July. Then again, it's not every day that a Florida attraction takes guests into a year-round 30-degree environment. But that's exactly what SeaWorld Orlando does with Antarctica: Empire of the Penguin. The ambitious ride incorporates newfangled trackless vehicles to take guests on a cool (literally) journey into the world of the compelling birds that live at the bottom of the world. Thrill Scale (0=Wimpy!, 10=Yikes! ): 1.5 or 2.5, depending on the ride vehicles that guests choose. The "Mild Expedition" offers a gentle ride with minimal spinning or other jarring movements. The "Wild Expedition" features more aggressive ride elements, including spinning, but it is still comparatively tame. Height restriction to ride: 42 inches (under 48 inches with adult supervision) for the Wild Expedition. There is no height requirement for the "Mild Expedition," but riders need to be able to sit up independently. Part of SeaWorld's Quick Queue program, guests can pay an additional fee to skip to the front of the line. Learn other strategies to reduce wait times at SeaWorld Orlando. Because it can be one of the park's most popular rides, and because its capacity does not seem all that high, you might want to consider getting in line early or late in the day to avoid the inevitable midday crush and patience-crushing lines—especially during the summer, the week between Christmas and New Year's and other busy times. If the line is long, much of the wait is outside. That makes entering the cool confines of the initial indoor preshow area especially welcome. Once inside, overhead screens, which are irregularly shaped and built into simulated glacial rockwork, introduce guests to Puck, a baby penguin. Like the park's TurtleTrek show, the computer-generated animation used in Antarctica is photo-realistic and well done. The gist of the story—and the narrative is sparse—is that the South Pole is a harsh environment and survival is difficult without the help and cooperation of family and friends. With that commentary, guests are told that a storm is approaching, and that they should seek shelter. They are led into another room filled with colorful ice-like structures. Passengers are told that they need to choose either a "Mild Expedition" or a "Wild Expedition" and choose the appropriate line. The mild queue is typically shorter and could save a few minutes of wait time. Is it worth it? Riders in both vehicles experience the same show, but the wild cars deliver a bit more of an aggressive ride (with an emphasis on "a bit"). In no way, would the so-called wild option be considered a thrill ride. If you have an aversion to spinning rides, you probably would want to stick with the mild version. If you prefer action, you should try the wild vehicles. But if you've already been waiting a long time, and the queue for the mild ride looks considerably shorter, you shouldn't worry about missing much by foregoing a spin on the wild side. You could always get your thrill fix by heading to one of SeaWorld's wonderful coasters. Eight guests at a time are directed to small pre-boarding rooms (not unlike the pre-loading rooms for The Simpsons Ride at Universal Studios) where they view a final, brief clip reintroducing them to a slightly older Puck who is about to embark on an adventure. The narrator tells us that we will get to share his experience through the penguin's eyes. A door opens to reveal the awaiting ride vehicles. Like the Indiana Jones Adventure at Disneyland or Transformers: The Ride 3D at Universal Studios, the ride vehicles are independent, roving motion bases and are capable of spinning, tilting, pitching, and other movements. Unlike those attractions, the groundbreaking Antarctica vehicles are trackless and use onboard computers and magnetic technology to navigate through the ride. They are capable of taking multiple routes and delivering a variety of elements; in fact any one vehicle could be reprogrammed on the spot to provide either a mild or wild ride. Re-rides, therefore, would likely provide slightly different experiences each time. It's disappointing therefore that SeaWorld doesn't really take advantage of the impressive ride system. The action essentially takes place in two fairly small rooms. In the first one, passengers move through a not-very-convincing facsimile of Antarctica with stylized representations of icicles and other tundra elements. Puck momentarily appears, via video screens, as reflections in the scenery. The vehicles glide and maneuver a bit (the wild cars more than the mild ones) to simulate the bird's waddling and sliding on the ice. Mostly, however, not much happens. There are no animatronics and not much in the way of sensory elements. While the air is cooled to the 40s during the ride (it is about 60 in the queue), there is no attempt to replicate snow or other harsh South Pole conditions. And because the vehicles take different paths and move around each other in the room, there is no linear story at this point of the attraction. No attempt is made to shield the vehicles or riders from one another. It is a bit odd to see the other vehicles haphazardly spinning, moving, and marching to the beat of their own computerized drummer. After maneuvering around the room, the vehicles all eventually make their way into the second room where they take position in front of a large screen. The last half of the ride is more of a theatrical presentation. While the vehicles mimic the action in the film (again, the wild ones offer slightly more extreme movements), they more or less stay in one place as Puck courts danger by venturing off on his own for a few moments. The vehicles then simultaneously turn to face away from the screen, and a window on the other side of the room illuminates to reveal actual penguins. Up until this point, the animals are all virtual. Antarctica Empire of the Penguin may illustrate a possible future trend for marine life parks such as SeaWorld. Instead of presenting actual animals, a practice that is becoming increasingly controversial, perhaps they could evolve and use themed entertainment technology to present digital representations of some or all of the animals. After all, Daniel Radcliffe and the other stars of the Harry Potter film series are not in residence at the Universal parks. But visitors can still fly with Harry above the Hogwarts school and have other adventures alongside the characters at the Wizarding World of Harry Potter. 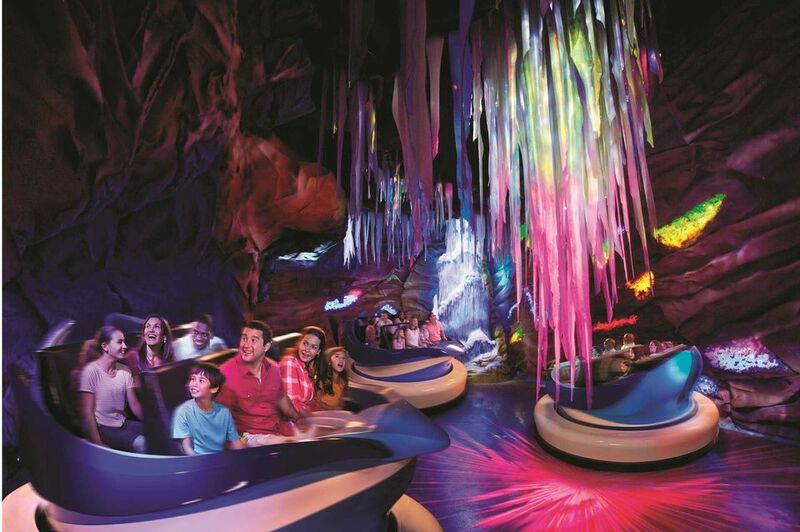 Similarly, E-Ticket attractions could transport visitors to virtual underwater realms, although it would take sizable budgets to do it convincingly. For its finale the Antarctica vehicles take guests to SeaWorld's penguin habitat, where they disembark to view the (actual) birds. Educators are available to answer questions and provide info. Depending on when you ride, the lighting may be low to simulate the sun cycles in the penguins' natural habitat. But it will always be 30 degrees; depending on your tolerance for cold temperatures, you may not want to linger too long. There are many wonderful things about the attraction, including its intriguing ride system, its wonderful score (the original music is blockbuster-film worthy), and the real and computer-generated penguins who are its stars. And we applaud SeaWorld for taking the bold initiative to build a major-league attraction. But since it is based in Orlando (and charges Orlando-level admission fees), SeaWorld should be held to the standards set by Disney World and Universal Orlando. Given that incredibly high bar, the ride feels rushed and too short, and the tantalizing potential of the trackless vehicles is never truly explored. That, we are afraid, may leave you feeling a bit cold.